The combination of growth and value makes these three stocks this Fool's top healthcare picks for the year ahead. The S&P 500 gained double digits in 2016, but healthcare investors were largely left out in the cold. 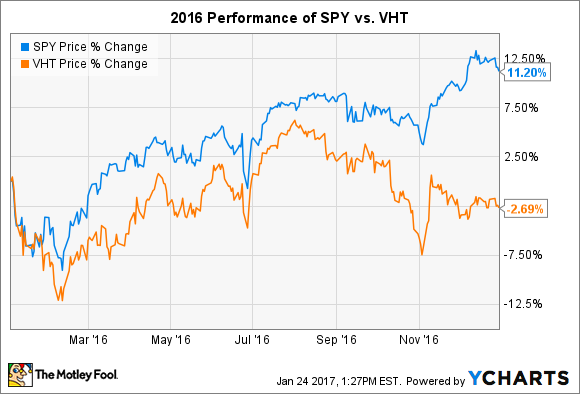 Shares of the Vanguard Health Care ETF (NYSEMKT: VHT), a widely held index fund that focuses on the sector, actually declined by more than 2% during the year. The performance discrepancy suggests that there are some real bargains to be found in the sector. With that in mind, here's why I think Pfizer (NYSE:PFE), Illumina (NASDAQ:ILMN), and Jazz Pharmaceuticals (NASDAQ:JAZZ) are all great healthcare stocks to buy for the year ahead. Pfizer's investors have long benefited from the company's storied history of developing or buying drugs that go on to become best-sellers. When I take a fresh look at the company's financials, I can't help feeling Pfizer looks well positioned to keep delivering for shareholders. Pfizer's current product lineup includes a number of fast-growing drugs such as its pneumococcal vaccine Prevnar 13, the breast cancer drug Ibrance, and blood thinner Eliquis. When these newer drugs are combined with the company's legacy products, Pfizer's revenue continues to head higher with each passing quarter. Looking ahead, I think investors can bank on seeing the trend continue. Last year, Pfizer won a bidding war for Medivation, which added a fast-growing prostate cancer drug called Xtandi to its portfolio. The company also succeeded at scooping up Anacor, which added an atopic dermatitis drug called Eucrisa to its lineup. Both of these drugs promise multibillion-dollar sales potential and stand a great chance at driving top-line growth. Despite its broad portfolio and pipeline of potential, Pfizer's shares are currently trading for 13 times full-year earnings estimates. Add in a well-covered dividend yield of 4%, and I think this stock is a value hiding in plain sight. In 2001, it cost researchers more than $100 million to sequence a human genome. Fast-forward to today, and Illumina has helped bring that cost all the way down to $1,000. That monumental cost shift is helping drive adoption like never before, and many believe that the age of personalized medicine is finally drawing near. While Illumina's past success has been nothing short of amazing, there are reasons to believe that the company's growth is just getting started. Illumina recently stole the show at the 2017 J.P. Morgan Healthcare conference by releasing a barrage of exciting announcements. Included in the list was the launch of two new partnerships with Philips and IBM. The goal of these collaborations is to help give researchers and clinicians new tools to "standardize and simplify genomic data interpretation." If that wasn't exciting enough, Illumina also announced the launch of two next-generation genomic sequencing machines. The first was built with partner Bio-Rad Laboratories, and it was designed to allow researchers the ability to study the human body at the individual cell level. The second machine is the company's new NovaSeq series, which promise to one day enable a gene to be sequenced for as little as $100. Traders bid up shares when the news was announced, but the company's stock is still down more than 32% from its all-time high. If you believe that these new partnerships and products will help revive sales growth, then buying a few shares while they trade at a discount could prove to be a smart decision. For a company that consistently produces double-digit growth, Jazz Pharmaceuticals doesn't get a whole lot of respect. Shares declined by more than 22% in 2016, in part because management dialed back its full-year profit guidance after it spent $1.5 billion to acquire Celator Pharmaceuticals. When combined with the potential for politicians to curb the company's long history of raising prices on its top-selling narcolepsy drug, Xyrem, it's understandable why traders have been worried about the company's future. While investors need to keep an eye on Xyrem's sales from here, I can't help thinking the decline is overdone, since Jazz has a promising year ahead. In the coming months, Jazz will complete its regulatory submission of Vyxeos -- Celator's lead product candidate -- in both the U.S. and Europe. If all goes well, this drug could be available for sale before year's end. Current estimates call for this drug to bring in up to $400 million in peak annual sales. If true, Jazz looks like it got a decent deal by buying Celator, and Vyxeos could go a long way toward helping to diversify Jazz's revenue away from its dependence on Xyrem. In total, market watchers believe that Jazz can grow its profits by more than 17% over the next five years. With shares trading for less than 11 times forward earnings estimates, Jazz is a growth stock with a value price.